Local MLAs and councillors broke ground Friday morning on a new commercial truck parking facility on Nordel Way at Highway 91. Officials broke ground Friday morning on a new commercial truck parking facility in Delta. The site of new $2.8-million parking facility is located on a former provincial works yard on Nordel Way at Highway 91 across from the Nordel commercial vehicle inspection facility. The facility will have room for up to 40 heavy trucks to park overnight and will include lighting, washrooms, garbage cans and a sani-dump. The project is part of the government’s 10-year “B.C. on the Move” transportation plan which it launched in spring 2015. Preparation of the site began last year and the facility is expected to up and running by this fall. Delta North MLA Scott Hamilton, who spoke at the ceremony on behalf of Minister of Transportation and Infrastructure Todd Stone, said the facility is part of the government’s commitment to improving the province’s transportation network and supporting B.C.’s economic well-being. Hamilton said the facility is unlikely to significantly impact traffic in the area. “If we’re talking about 40 trucks coming and going at different times of the day, I think obviously [the impact] would be nominal,” Hamilton said. He pointing to ongoing talks with the federal government regarding upgrades and full interchanges at the intersection of Nordel Way and Highway 9 and the $30-million overpass planned for the intersection of 72 Avenue and Highway 91 as likely to have a much more direct effect. Hamilton also acknowledged the facility won’t have a major impact on the lack of parking and staging facilities in the region, but said it’s a step in the right direction. Last fall, Stone told the Cloverdale Chamber of Commerce that the province acknowledges there is a serious shortage of parking and staging areas for larger commercial trucks across the Lower Mainland. At the time, the City of Surrey estimated about half of the more than 12,000 heavy trucks registered there had no legal place to park. To address the issue, the ministry conducted a survey of the trucking industry online and through the BC Trucking Association to ensure parking, staging and inspection pullout facilities meet the industry’s needs. 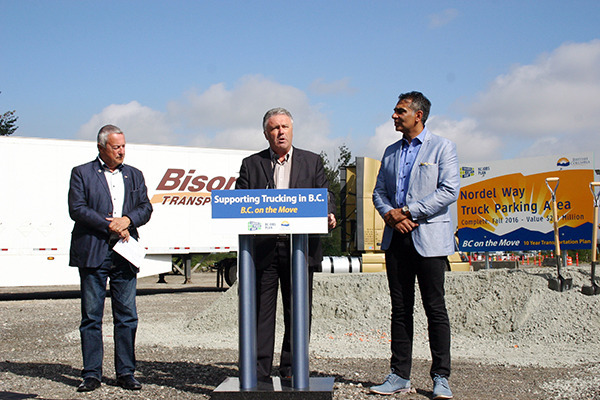 Since then, the province has built nine new truck inspection pullouts across the province, and t Nordel Way parking facility is the first of two that will be built in the Lower Mainland. Ashok Bhatti, regional director with the ministry of transportation, said the government it still evaluating potential sites and narrowing the list of candidates for the second facility. Bhatti said the ministry is looking at sites in Delta, Surrey and the Fraser Valley, but has no timeline for when the second site will be operational. With files from Dan Ferguson.